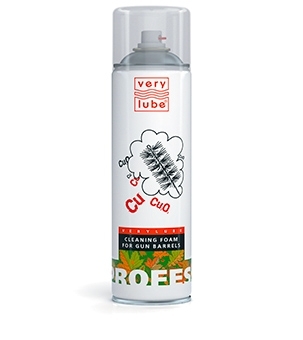 Safe product for cleaning the internal surfaces of the barrel bore from copper residues. Applied to rifled and smooth-bore arms of any caliber. Foam cleaning method of barrels is approved by NATO. Due to its high efficiency and safety, the foam cleaning method exceeds barrel cleaning methods with special oils and wire brush. 1. Let the gun cool down to the room temperature, disassemble it for cleaning. Close the barrel breech (with a rag, false cartridge etc.). 3. Spray the content into the barrel bore till the foam appears from the muzzle. 4. Wait for 15-30 min, then remove the foam remains with a clean rag. (As a result of the reaction with copper compounds the foam becomes blue). 5. Repeat the foam cleaning if necessary. 6. After the cleaning, treat the barrel with the grease (Gun Cleaning or Gun Conserving grease VERYLUBE). One can (500 ml) is enough for cleaning Win.308 (7.62 mm) barrel for about 100 times.